This modern penthouse-style apartment affords wonderful river views from the living areas, large balcony and master bedroom. Outdoor furniture on the balcony provides a wonderful place to relax and take in the view of the river below and across to the Taupo domain. Our well equipped kitchen has everything you need to prepare meals or snacks. Fitted with dual-dishwasher, fridge/freezer, microwave, hob and oven, jug and toaster. Beautifully furnished and comfortable living on one level with a double-garage below. Secure within the Watermark gated complex. Free wifi, flatscreen TV, soundbar. Netflix (free) in the apartment and available for our guests - please note the TV does not show free-to-air channels. Two kayaks are available for guest use, complimentary. Lifejackets provided. Just a five minute walk to town for cafes, bars, restaurants and shopping. Nearest supermarket only a few minutes walk. Located in a quiet neighbourhood yet so close to town. 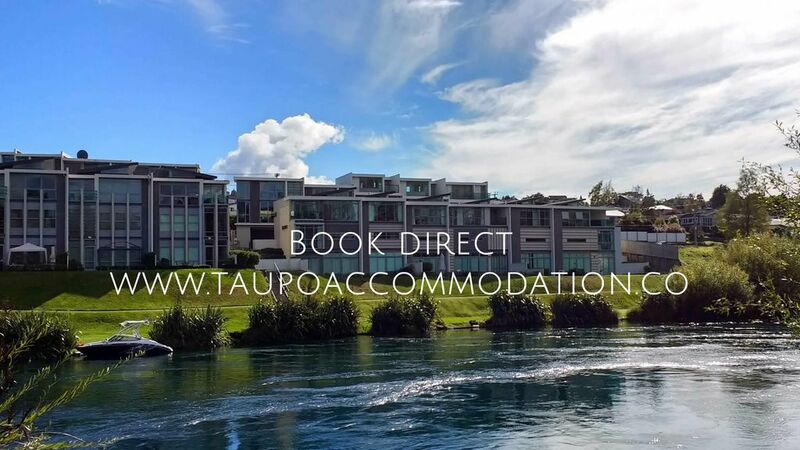 Taupo and the surrounding area has fantastic cultural activities and sights, is close to the Tongariro Alpine crossing and the many geo-thermal tourism locations. The swimming pool is heated from Labour Weekend (October) until Easter. Immaculately clean and presented we look forward to welcoming you to Riverside Apartment 2. We also have a three-bedroom apartment in the same complex (also with stunning river views) available on Bookabach under listing ID 17272. Smoking is strictly allowed outside only. Noise must be kept to a minimum as this apartment is in a residential complex. There is a strict NO PARTY policy in this apartment. We reserve the right to request a bond for bookings. This apartment is unfortunately not suitable for wheelchair bound persons (one set of stairs).Min stay 2 nights. 3 nights min during Easter. 5 nights min for IronMan and during summer holidays / peak times. Two bedrooms, master has a queen bed with stunning river views. Second bedroom with two single beds. Direct access to the river for swimming is available. Please exercise caution as strong currents are present and children must be monitored. Non-strong swimmers should use the onsite swimming pool. Glimpses of the lake from the balcony. Absolute riverfront views. Beautiful and tranquil vistas over the Waikato River. Absolute riverfront location. Fish for trout or kayak directly in front of the apartment. Wall heaters in living room and bedrooms. Portable heater in hall cupboard. Underfloor heating in bathrooms and kitchen. Located directly below the apartment for safe, internal access - two car parking included free of charge. Sofa (with sofa bed), flatscreen TV, free Netflix and wifi. Limited condiments, oils, salt, pepper, coffee and tea provided. Spacious dining area seats up to six. Four bar stools provided also. Flatscreen TV with soundbar and free Netflix. TV (free to air channels only, sorry, no SkyTV). Sound bar (bluetooth connection) provided. Spacious balcony overlooking the Waikato River. Outdoor furniture provided. Free for guest use. Heated from October to April. Our apartment is well equipped, full kitchen provided. Free wifi, free swimming pool and free use of our kayaks. Secure two-car garaging - close to town - an easy walk to supermarkets, bars, restaurants, shops and cafes. The shared pool was so cloudy you couldn’t see the bottom. Would get more stars if there were more cooking accessories and if there was aircon. Sorry you were disappointed with the quality of the pool water - as are we. The pump, pool media (sand) is being changed as I write this. We would be interested in finding what cooking accessories you were missing because the guests normally find that it is well appointed. What could be added? No aircon - fair point, but we don't advertise it as having it either. The view is great, but the linen seems not so clean. The view is great, but the linen seems not so clean. The under-floor heating didn't work at all in such cold weather. Hi Nan, sorry we were unable to get the underfloor fixed while you were there over the weekend - we are having it looked at this week (up until your stay we have had no problems with it). With regards to the linen, we pride ourselves on the cleanliness of the apartment and am concerned by this comment, can you please message me with more information? I am sorry you did not say something when we were trying to sort out the underfloor as we could have done something about it then. Amazing place! Clean, very comfortable, convenient and with beautiful views. Amazing place! Clean, very comfortable, convenient and with beautiful views. We will definitely be back ?? Close to the Huka Falls, golf courses and all Taupo tourist attractions.